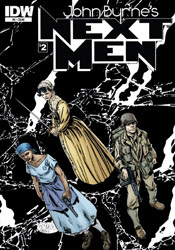 After fifteen years, comics legend John Byrne has returned to his first creator-owned property, Next Men. A pondering on the feasibility of a squad of government-created superhumans in the real world, the series was a moderate hit for Dark Horse before Byrne placed it on the backburner to investigate new ideas in the mid-'90s. Now, in addition to adopting a new publisher, the series seems to be moving in an entirely new direction. Though time travel was never a foreign concept to the original stories, in this modern revival it’s become the plot’s sole motivation. By means that have yet to be revealed, the group has been split up, both physically and temporally. They’re visiting different times, places, mentalities and situations, with some handling the predicament more elegantly than others. Byrne, never being one to shy away from a controversy, has naturally dropped his creations into some of the most politically charged moments modern history has to offer. After all, what jaunt through time and space would be complete without a visit to German concentration camps and the Confederate States of America? Though unapologetic stereotypes abound freely in each location, Byrne does make some base efforts to tell stories with a message, something beyond the basic idea that slavery/anti-semitism is wrong. The stories aren’t easy to read, particularly if you’d developed any sort of affinity for the characters he so willingly drags through the worst our world has to offer, but they’re also weightier than the simple caricatures they appeared to be at first glance. Byrne’s artwork is sufficient if not spectacular. He places a lot of emphasis on getting each historical setting just right, with appropriate attire, architecture and attitude, which really helps to authenticate each chapter. His actual execution, though, is often under-thought, uncomfortably exaggerated and sorely lacking in polish. While his writing is sometimes (though not always) working against the natural tendency to cast the bad guys as a single, faceless mob, Byrne’s illustrations only reinforce that idea. Though his plot features countless opportunities for a striking visual or explosive development, his visual chops just aren’t up for a delivery. It’s a dry, dull look and feel for Next Men V2, from cover to cover. Like so much of this issue’s cast, John Byrne seems to be lost in time, plodding along with a mindset and toolbox that’s neither appropriate nor advisable for the era in which it appears. The story’s slow, deliberate pace and hackneyed dialog let down a concept that could’ve had legs. The few moments of excitement that the plot musters are quickly squashed by Byrne’s own drab, incomplete artwork. At the end of the day, this seems like the work of a creator who’s taken on more than he can handle and, as a result, falls back to his old habits just to get the job done. Perhaps the aid of a dedicated artist or storytelling assistant could’ve transformed this into all it had the potential to be... or perhaps not. In its present state, I’d suggest you skip it.